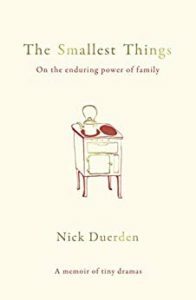 I’m so pleased to have an extract to share with you today from The Smallest Things by Nick Duerden. It sounds like a delightful read. My thanks to Alison Menzies for asking me to do this post. A memoir of the tiny dramas that fill all our lives, and a celebration of the special ties that can bind two intimately connected strangers. Tender and poignant, The Smallest Things captures the richness, and also the complexity, of family life. Nick Duerden’s grandparents were always just . . . there. A mysterious yet unchanging presence, a source of dutiful visits, birthday cards and carefully preserved rituals: lunches, dinners and endless card games. But, as he enters midlife, and his 98-year-old grandmother enters a care home, he realises that, like so many of us, he should perhaps have paid more attention to her true worth years before. You should be mindful, please, to extend certain common courtesies towards us. You may have grown up and moved on, as is the nature of these things, but we have remained. We are still here. Think about that. We are still here in the place that you left us – home – and you can be assured that we are mourning your loss. It’s not that we want to intervene at every possible juncture of your life, because we don’t. Enough to be included. We want to hear when things are going well, and when things are going badly. (We might be able to help if things are going badly.) We want more than postcards from golden beaches in July, and Christmas cards in December. We want to hear your voice regularly, to be reminded that we are remembered, and that you still care, that we still matter, and have a place in your adult lives. We can come for Sunday lunch; we can fly over whenever convenient; we can talk on the phone. Ideally, we’d like to be consulted, conferred with, included; we know a lot about childcare, remember? We are here for you, always here. Most importantly, please don’t let us drift too far apart. Don’t fall silent. And if we text you, text back. A text message is never rhetorical. Published by Elliott & Thompson on 14 February, £12.99 hardback. 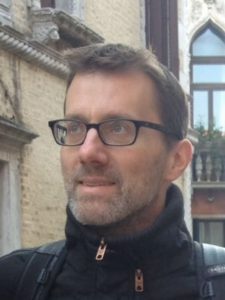 Nick Duerden is the author of five books, including two novels. His first work of emotionally intelligent non-fiction was The Reluctant Fathers’ Club: or How I Learned to Stop Worrying and Cautiously Embrace Parenthood (Short Books, 2009), followed by Get Well Soon: Adventures in Alternative Healthcare (Bloomsbury, 2018) and A Life Less Lonely: What We Can All Do to Lead More Connected, Kinder Lives (Bloomsbury, 2018). His by-line appears widely from the Guardian, Sunday Times, Daily Mail, GQ, Esquire to Elle. He is an experienced broadcaster appearing on national TV and radio stations from Sky News to BBC Radios 4 and 5. Nick is available for interview and commission. He lives in London with his wife and 2 daughters.